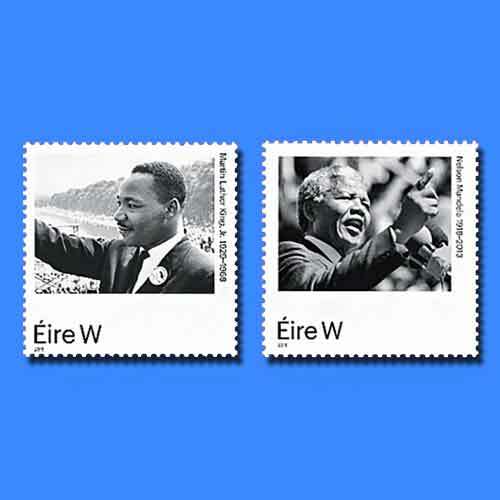 An post from Ireland issued two new postage stamps featuring Martin Luther King Jr. and Nelson Mandela on 5th April in a set called International Statesmen. Both of them are shown addressing a mass public gathering. One stamp shows Martin Luther King at the 1963 March on Washington that was held for Jobs and Freedom. He had delivered the famous “I Have a Dream Speech” from the Lincoln Memorial to almost 250,000 people on 28th August 1963. The Civil Rights Act came into effect within 1 year after that speech. King received the Nobel Peace Prize in 1964 and was assassinated on 4th April 1968. His name and the years of his birth and death “1929-1968” are also featured on the stamp. The country name “Eire” and a “W” for basic domestic rate are also mentioned. Nelson Mandela was the president of South Africa from 1994-99 and received a Nobel Prize in December 1993. He was the son of an African Chief and went on to become South Africa’s first black lawyers. He was a leader of the African National Congress (ANC) in the 1950s. He was sentenced to life imprisonment for his revolts in 1962 and released 27 years later, on 11th February 1990. The stamp shows Mandela delivering a speech to a crowd at Soweto in September 1990.